The stream underneath the trail on which you stand, runs through an interesting piece of history. 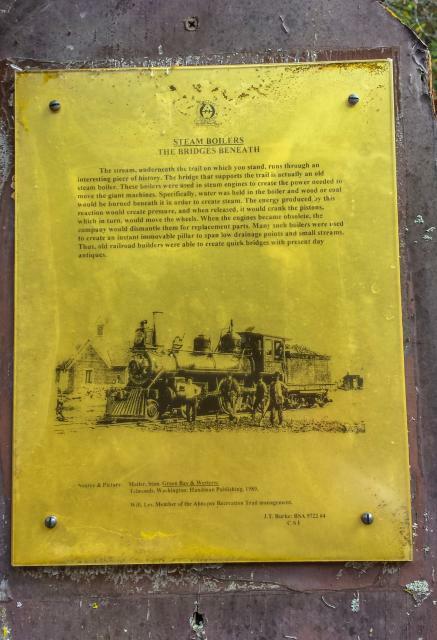 The bridge that supports the trail is actually an old steam boiler. These boilerswere used in steam engines to create the power needed to move the giant machines. Specifically, water was held in the boiler and wood or coal would be burned beneath it in order to create steam. The energy produced by this reaction would create pressure, and when released, it would crank the pistons, which in turn, would move the wheels. When the engines became obsolete, the company would dismantle them for replacement parts. Many such boilers were used to create an instant immovable pillar to span low drainage points and small streams. Thus, old railroad builders were able to create quick bridges with present day antiques. Edmonds, Washington: Hundman Publishing, 1989. Located along the Ahnapee State Trail. This marker can also be identified by its HM code. You can use the hashtag #HM1KGU in tweets, and any other place where you might refer to this marker, including when searching on this site.